Hi, it’s Grey. I just saw that the first part of my epic Battle of Bri’s Bane epic trilogy poem has appeared on my Werewolf of Oz blog, so I thought I’d tell you straight away. We’ll bring it into the Greenygrey world as soon as possible. Sorry for asking you to read things twice, and thanks for reading the unfinished drafts. I hope to have ironed out all the grey areas by the end! Cheers. 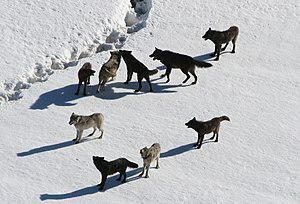 Also, tonight at 10 on BBC4 there’s a Natural World documentary on the Wolf Pack (http://www.bbc.co.uk/programmes/b0078ps7). I think I’ve seen it before, and it’s a warts n’ all documentary, so not all good for wolves, but is a balanced look at the wolf and how it really lives (unlike the wolfophobia of The Grey film!). Marc Latham’s latest Folding Mirror poem started out as one about perception and reflection, and what we see not always being real; but then the inclusion of sun, plasma and sky twisted it more into a Rupert Murdoch, News International, Sun and News of the World newspapers, Sky television one. It is quite timely, with The Sun on Sunday first published yesterday, and maybe that was what unconsciously inspired it. Media privacy was also discussed yesterday on The Big Questions, which is available in the UK until next Sunday, March 4th in the UK; don’t know about other availability. It was great to reacquaint with the Collie twins. Everybody was enjoying the moment, although we knew that a bruising battle lay ahead with Bri’s bane. We partied through the night, with a band of Beatles starring in the Cavern, and then set off north the next morning. Emily and Brian led us through the secret cave for ten hours, until we at last reached the safe haven of Chinchilla. The Chinchilla chinchillas were also locked in a perennial struggle with Bri’s bane, and so we were warmly welcomed. Emily and Brian introduced us all to the chinchilla leader, Pancho Churchilla, and he thanked us for our effort and support. When evening arrived, we all ascended into the fresh air, and basked in the Chinchilla sunset chinchilla style. 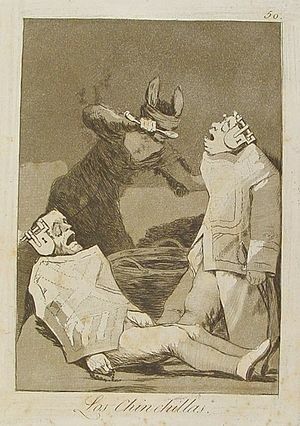 We rested overnight underground in the burrow barracks of the Chinchillas of Goya (COG); a crack unit of chinchilla commandos that are the teeth of the chinchilla army sprocket. They gave us their nests and slept on the floor, as their training had hardened them to such inconvenience. I didn’t like to take the nest, but we had been on a long hard journey; as long as the COG could maintain rotation without such self-maintenance. Someone had scrawled a message on the rock next to my nest that haunted my sleep that night. It said: Born to Bask, Live for Task. It was signed CC, so I guess it must have been Cilla Chinchilla who wrote it; Pancho said she was the one who normally slept there. I thought it was a shame such a chilled chinchilla should have to live this way, and dreamt that one day soon the chinchillas would be able to once more bask in peace. We were awoken at first light. After a short preparation we started on our final march to Bri’s bane. Nerves, excitement and fear all mixed together to activate anarchic adrenalin. Three hours after leaving Chinchilla we received word that a rockfall had blocked the tunnel. Colin and Ollie were informed, and soon raced ahead to clear the way. Their colliering skills meant we surfaced at The Gap on schedule. The sun was reaching its apex as the COG led us into the daylight of our destiny. I had faded to grey, and felt comfortable that way. 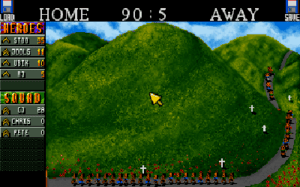 Emily and Brian led the COG commandos at the head of our line; I had never seen such courage from a pair of hats. Although they shone with a golden hue when first meeting again, nobody could accuse them of being yella in a cowardly way. Talking of yellow, I was missing Emily not being on my head, with the scorching sun sizzling my sight and cooking my cranium! It was a relief when we reached some tree cover. We covertly met a covert of coots in the Mount Coot-Tha forest, and they led us over the hill. 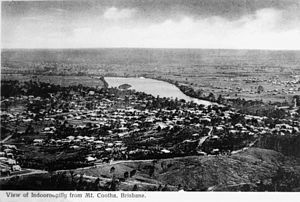 We continued east to rendezvous with a python called Pilly, and it showed us a short-cut through a secret door at Indooroopilly. Emerging through the outdoor, a river lay below us. Churchilla said it was Bri’s bane’s main defensive line. I couldn’t imagine how all the furry little chinchillas were going to cross the river, but I was in for another nice surprise. When we arrived at the river, more of my West Coast friends were in it: Winona, Walter, Wendy, William and Dweezil whale sharks; and Dolly the Dolphin. Moreover, there was also a big boat moored there, and who should be skippering it but Captain Dec O’ Rum. I asked where Dai ‘on the Seas’ was. Dec said he was doing fine, and had gone into town looking for wine and women. It was a magnificent morale booster to see them all again, and a renewed confidence surged through me. After hugs and greetings, they helped us cross the river. Although it was a relief that we’d all traversed the water safely, arriving on the other side felt like being on the sharp end of a double-edged sword; because we were now at the foot of Greenslopes, with battalions of Bri’s bane protecting the peak. Hi, it’s Harry Silhouetteof-Wolfhowlingonthehill. Yes, the Yorkshire episode of The Great British Countryside lived up to expectations, with lots of greenygreyness from beginning to end. There are a lot of great countryside places they didn’t focus on, such as the Three Peaks, Brimham Rocks, Ingleton, Scarborough to Whitby coast etc, but I suppose there’s only so many places you can fit into an hour long programme. There were no startling new revelations, like the previous week’s copper greenygreyness, just the usual green fields and grey rocks, sea and sky. But they did look very beautiful a lot of the time, with green and grey shown to be working together in timeless harmony. And we did notice that even the title image of the programme is in greenygrey, and looks like it might be an image from Yorkshire. Hi, it’s Harry Silhouetteof-Wolfhowlingonthehill. We’re really looking forward to tonight’s second episode of The Great British Countryside at 8pm, as it’s focusing on Yorkshire. Yorkshire’s the home of Bronte country, with the Bronte sisters setting their novels within a brooding greenygreyness. So we’re hoping there’s lots of our favourite colour combination in tonight’s episode. It certainly looks like there will be from the photo on the programme’s site, available from the above link. There was a lot of greenygreyness in last week’s first episode, which focused on Devon and Cornwall. While we’d seen most of it before, we were surprised to see that copper is so greenygrey. So we took a screen print to show you, and it’s copied below. There are still three weeks left to watch the first episode on iplayer in the UK; don’t know about other availability. Enjoy! Hi, it’s Grey. I have been hearing of a growing wolfophobia in 2012, and today I saw it with my own eyes. I heard Celebrity Big Brother had wolfophobic games in the show, and The Grey film showed wolves in a false light. This is disappointing after I caught up with 2011’s Frozen Planet documentary series showing real wolves to be brave, caring and resilient; as they struggle to survive in the planet’s extremities. Go Compare already has a reputation for naff adverts. I read on the Metro website that the company’s adverts were voted the most annoying two years running: in 2009 and 2010 . The Three Little Pigs theme, which was also used in Celebrity Big Brother, is used by Go Compare to depict a human saving the pigs from a wolf. The wolf seems to represent the greedy people who have threatened the British economy. While the Go Compare advert seems to be trying to send the message that it can be trusted, it is of course using a false reality. The truth is that pigs have been manufactured by humanity out of boars, which are strong intelligent creatures, and not just the walking bacon and pork many people now see when they look at a pig. Therefore, it is humanity that has done most harm to pigs and their ancestors. And rather than the wolf being greedy and destructive, it is humanity that has destroyed large areas of the world, including many homes of the wolf. Here’s the advert, followed by the new one by their Compare the Market rivals. We love the Orlovs!